This article is from the Winter 2001 AFRMA Rat & Mouse Tales news-magazine. QI would like to ask the following questions if I might. They are either strange things I’ve read here and there, or facts that I’ve seen widely contradicted. I was hoping you might shed some light on them. Do cheese and chocolate make mice smell? Does eating meat make mice cannibalistic? Is newsprint (especially colored) bad for mice if they eat it? Do most vets treat mice? ACheese and chocolate should not be fed to mice or rats—they can’t digest chocolate, milk will make rats smell—usually it is only fed (with bread) to babies (orphans or large litters). Also, cheese and chocolate are very high in fat, which mice don’t need. If you want to give your mice a treat, they love the low-sugar type cereals like Cheerios and shredded wheat. They also like pieces of whole wheat bread. Newsprint has chemicals that can irritate the skin as well as make the animal dirty from the ink. 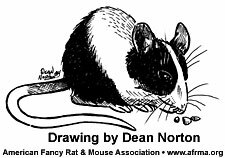 If kept on newsprint, many rats and mice will constantly groom themselves in an attempt to rid their fur of the ink, which means they are ingesting all this ink. Not a healthy situation. Hardwood or paper products (non-toxic bedding) should be the bedding of choice. We recommend Sani-Chips®, CareFRESH™, Shredded Aspen, and Gentle Touch™ to name a few. No, meat will not make them cannibalistic, but rats may tend to get aggressive (fighting over the morsels if it is fed). It is one of their favorite foods, but it doesn’t need to be fed to them. Meat and dairy will also cause them to smell. Remember, wild mice and rats often eat insects, and rats will even hunt for birds and other small mammals. Cooked soup bones, rib bones, fresh veggies, fruits, whole wheat bread, etc., are ideal treats for your pets. About the only time mice or rats might become cannibals is if they run out of food or water (for several days). Also, they can eat babies if food and water are not available, or if one dies. Sometimes when one dies in the cage, its roommates will try and dispose of the body by chewing/eating it. Most of the time they try to bury it. This is normal behavior, since in the wild the odor of a deceased rat or mouse would draw predators. You would have to check your local vets to see if they treat mice. Some will, but may not be very experienced with their ailments, etc. It’s best to get a recommendation by someone who has found a vet they like and has the experience. Look in the Yellow Pages for a vet that treats exotics, such as reptiles and birds. These are the ones that likely will treat rodent pets. Some might even advertise that they treat “pocket pets.” It is becoming a little more common then it was, say, 10 or 15 years ago.